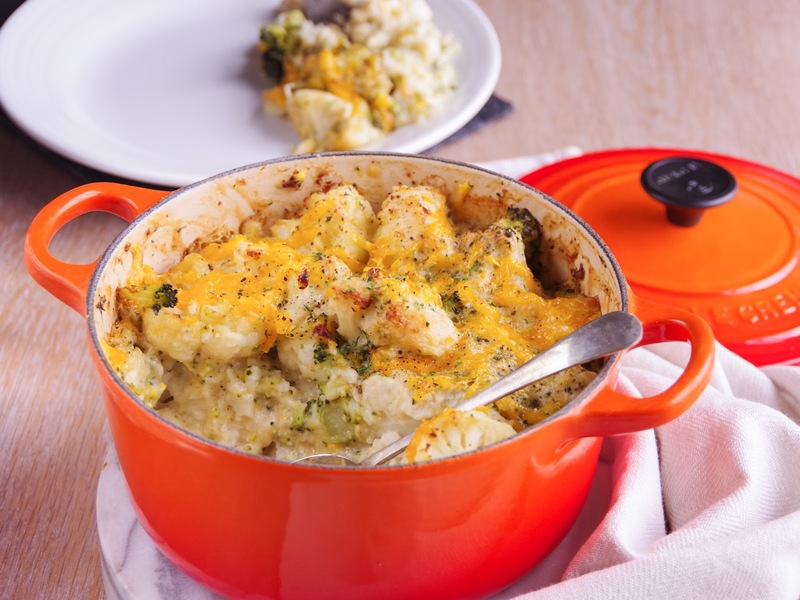 A delicious, creamy cauliflower broccoli cheese - if not a little on the rustic side - the perfect addition to your plate this Christmas. I used my ultimate vegan cheese sauce for this recipe, which I worked on perfecting for over a year, it's rich, creamy, super cheesy, with a hint of nutmeg and black pepper...the secret ingredients to a great vegan cheese sauce. 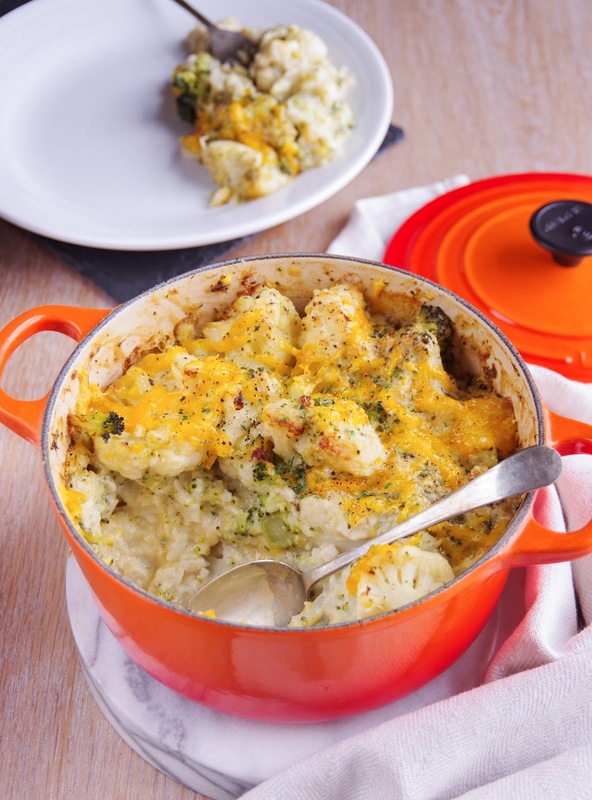 From looking online, cauliflower cheese seems to be quite a British thing, perhaps the counter part to the ever growing in popularity mac 'n' cheese from the US. Traditionally you wouldn't add broccoli, but I love the addition of it and the extra nutrition it brings too. 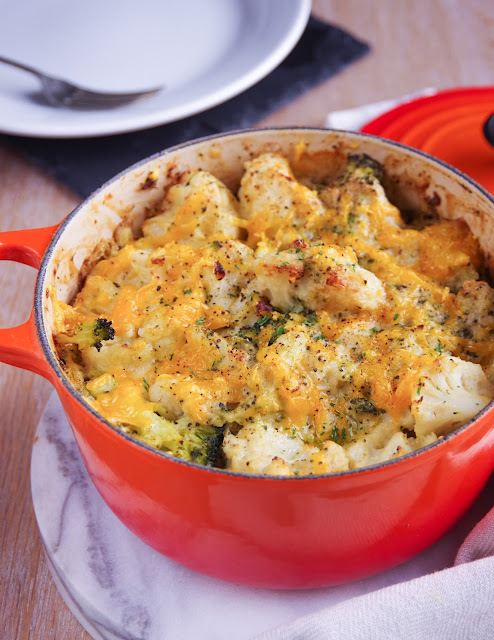 But if you're from overseas and you haven't yet experienced the wonder that is cauliflower and broccoli cheese, all rich and creamy and baked to perfection...well, you just need to this Christmas! Whilst this recipe is quite high in fat, from the cashews and vegan cheese, it also contains good fats and is rich in nutrients like iron, magnesium, vitamin C, Vitamin B6, protein, calcium, vitamin K and many many more. As you're going to bake this dish, be sure not to over cook the broccoli and cauliflower before you mix them with the sauce, having a little bite to them still is perfectly fine and will ensure a perfectly cooked dish. The great thing about this dish is that you can start it off on the hob and transfer it to the oven, using a heat-proof pot of course. I cooked this dish in my new Le Creuset casserole dish...my amazing Christmas gift from my bosses this year! (How lucky am I?!). The important thing when cooking with cast iron, or in this case enamelled cast iron is to heat the dish up slowly and once it's hot it will retain it's heat super well, meaning your dish will cook evenly and quickly too. It also stays hot for a while after taking it out the oven, which is perfect if you happen to be short on oven space when cooking your roast! *I used a nutribullet to make this recipe, but if you don't have a high-powered blender then I would recommend pre-soaking the cashew nuts for up to an hour prior to blending. **If you can't find tapioca starch, grind up tapioca pearls using a spice/coffee grinder and sieve to remove any un-blended pieces. Add the cashew nuts, water, tapioca starch, mustard, nutmeg, salt and pepper to the blender, blitz until completely smooth. Grate the cheese and place next to the cooker. Bring a large pan of slightly salted water to the boil. Cut the broccoli and cauliflower into florets and boil for 4 minutes. Meanwhile, add the mixture to an oven proof dish on a medium heat and whisk until it thickens. Once thick, add the grated cheese, reserving a little for sprinkling on the top and whisk until melted and smooth. Add the cooked veg and stir to combine well, top with the reserved cheese and a good amount of black pepper. Put the lid on and cook for 10 minutes, then remove the lid and cook for a further 10-15 minutes, until golden brown. Serve up and enjoy!